We're off to enjoy our 5th annual Legacy Genealogy Cruise, this year to Europe. We've got a great lineup of classes from genealogy's DearMYRTLE, Legacy's Geoff Rasmussen, and Legacy developers, Dave Berdan and Ken McGinnis. We'll visit England, Denmark, Germany, Russia, Finland, Estonia, and Sweden. We're looking forward to meeting many of our Legacy translators in these countries. Some of us have purchased new pants with the expandable waists to account for all the great food on board. Our sincere thanks go out to our entire technical support staff who will continue to provide support services while we are gone. Our sales department will also continue to operate. 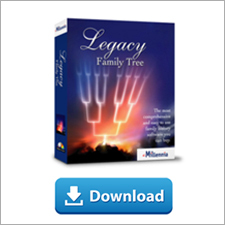 Either order online, call 1-800-753-3453, or email sales@legacyfamilytree.com. Thanks again to all of our wonderful Legacy users for making our Legacy 7 release so successful! We'll see you in a couple of weeks. Standard Edition users are required to visit our web site in order to download the new update. This update also addresses a number of fixes as reported by our users. To view this list, click here. We're excited to announce that our new Wall Chart Printing service is now ready to go! With just a few clicks in the new Legacy Charting software, your custom designed chart can be ordered for delivery to your front door. Legacy Charting, which is included with the new Legacy Family Tree 7.0, includes 18 different styles of wall charts, including ancestor, descendant, DNA, fan, hour glass, and bow tie charts. Each chart can be fully customized and can include full color pictures, custom text boxes, and even your own digital pictures for the background. Charts can be printed on regular white paper, or you can choose beautiful photo glossy paper, or even have it printed on matte canvas. To order your chart, in Legacy Charting, click on the Publish tab, then click on the Order Chart button. Here you can select your paper type and quantity. With an Internet connection, Legacy Charting will display the total price of the chart based on the size and selected options. No more wondering what the cost of the chart will be when you are ready to purchase it. If the displayed cost is a little out of range, just change the size of the boxes on the Appearance tab and the chart cost will automatically be adjusted. Open Legacy Charting, and click on the Tips & Updates tab. In the Updates section, click on the link to install the update and follow the prompts. The next time you run Legacy Charting, you will be able to purchase your chart. See http://www.legacycharting.com/samples.htm for examples of charts that can be created with Legacy Charting. 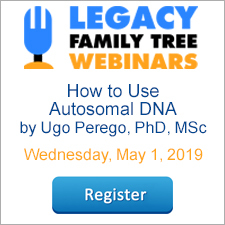 If you do not yet have Legacy 7.0, visit www.LegacyFamilyTree.com for more information. The standard edition of Legacy Charting (limited to 4 generations at a time) is available for free download at www.LegacyCharting.com. The Journal of One-Name Studies, published by The Guild of One-Name Studies, has just published a review of Legacy Family Tree 7.0 (Jul-Sep 2008 edition). They kindly gave us permission to republish a text-only edition below. Legacy users have been waiting for the arrival of Legacy 7 for some time. Originally promised for late 2007 it’s been a while coming, with delays sometimes causing frustration in the Legacy community. Version 7 features were shrouded in secrecy (understandably so), but now the wait is over and the Guild is amongst the first to receive a copy for review. So, has the wait been worth it? Legacy comes in two versions, Standard and Deluxe. The Standard version is completely free and can be downloaded from the Legacy website. The Standard version is great for the casual genealogist or for those who don’t require some of the more advanced functionality. However I think it is the Deluxe version with its rich feature set that would appeal more to Guild members, so I will be focusing on what’s new in Legacy 7 Deluxe. The first of the new version 7 features is mapping. Essentially Legacy 7 now incorporates the Microsoft Virtual Earth™ tool into Legacy 7. In order to use the mapping feature the user must have Internet Explorer 7 installed on their computer. Users should note that whilst this is needed for the mapping features, users can continue to use other browsers such as Firefox or Opera for general internet use. The master location list has been completely revamped to incorporate mapping (which can be turned on or off). With mapping turned on a map is displayed of any location selected in the master list. Vitual Earth will automatically determine a push pin for the location and place it on the map. If for some reason Virtual Earth has incorrectly positioned the pin you can right click to determine your own placement for the pin. The Virtual Earth interface enables you to pan and zoom the map as you wish. In addition there are a range of “views” available, including 2D, 3D, Road, Aerial & Birds Eye, with each showing the map from a different perspective. Another welcome addition to the master location list is the ability to see a list of the people associated with each location. Having all this information contained in one screen is great. The second (and probably the best) use of mapping is the ability to select an individual and display a map of all the individuals events. As well as the typical birth, marriage & death events you can also map any other recorded events or facts that include a location such as census, residences, military events and so on. In addition to the individual's events you can also include events for parents and children, though these are limited to birth and death events only. This is an extremely useful feature and helps to understand and appreciate an individual's movements or migration path. It would have been nice to be able to map ALL locations in your database to visualise in one map, but this is probably asking a little too much. One of Legacy’s biggest shortcomings in recent years has been the lack of a good charting package. Whilst it has scored highly on narrative reporting and other more textual based reports, many users felt it necessary to either export data into other packages or purchase add-on packages such as Legacy Charting Companion or Treedraw. 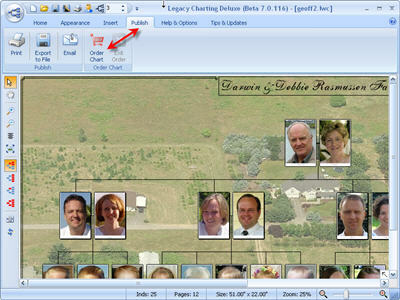 With the release of Legacy 7 Millennia has added their own charting tool called Legacy Charting. This is actually a separate program which seamlessly integrates with the main Legacy 7 program. Whilst Legacy Charting comes as part of your version 7 purchase I understand that Millennia intends to also offer this as a stand alone program to users of other applications. By default it can import data from GEDCOM, PAF, FTM & Roots Magic as well as Legacy. A wide range of chart types are available within Legacy Charting. There are 5 ancestor type charts, 2 descendant type charts and 4 DNA related charts (two for male, including carriers only and two for female lines). There are a further 4 fan type charts as well as an hourglass and bow tie chart. All in all a pretty comprehensive list. The interface for Legacy Charting is completely different to that of Legacy 7 itself and effectively imitates Microsoft’s Office 2007 ribbon type interface for those of you familiar with it. It’s a very clean looking interface with functions sorted into appropriate tabs. All of the expected functions are here, zooming, dragging by entire tree, entire line, generation, box etc. There’s also the ability to add comment boxes, pictures, backgrounds and titles. Somewhat more unusual is the ability to create and assign themes. These can contain a combination of fonts, colours, box styles and line styles. One of my favourite features is that you can update Legacy with information while working on a chart and the changes can immediately be reflected in Legacy Charting at the press of a button without the need to recreate the chart. I’ve always found Legacy to be pretty good at sourcing in previous versions however Millennia has seen fit to implement a new sourcing tool into the program called SourceWriter. 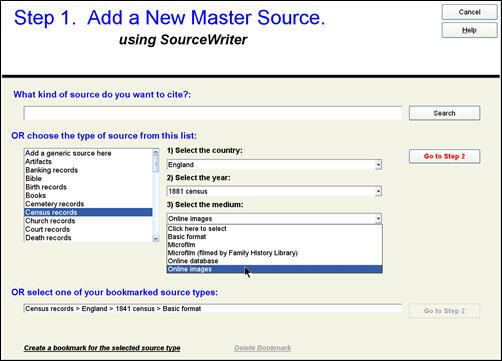 SourceWriter walks you through a wizard to create both master sources and source detail. The wizard uses templates based around the Elizabeth Shown Mills book, Evidence Explained. The first step is to create a master source using one of the templates. There’s a good range of templates covering a host of areas including the more awkward ones such as e-mail and online resources. The only disappointment here is that the templates are a little too US centric and don’t include specific templates for UK census or civil registration. [Note from Millennia: the next update will include templates for UK civil registration and census records. :) ] You can get by on the more generic templates without too much trouble though and there are indications that further templates will be developed, though I would have preferred to see an option to create my own. Once you have chosen the template to use you move onto step two which shows a raft of fields to complete based upon the chosen template. For instance choosing the e-mail template gives me sixteen possible entry fields from subject line, e-mail address & recorded date to writers & recipients cities. As you type data into each of the fields the source citation is built up on screen in real time showing differing previews for Footnote/Endnote, Subsequent citation & Bibliography. This makes it incredibly easy to see exactly how your source citation is going to look when output. The user can also add multimedia content, comments and citation overrides amongst other things. Another new feature is the Interview Center. This is a tool to help you build an interview questionnaire and has hundreds of interview questions to choose from. Questions are displayed in a “file browser” type window grouped by topic with a checkbox besides each question. The user simply checks the required questions and outputs the report. This formulates the chosen questions into a structured output to be used when carrying out interviews with relatives. There are a number of smaller improvements in Legacy 7 which the scope of this review can’t cover. These include a relationship calculator which can calculate the relationship between any two people and not only those connected through blood lines. Work has also been done to incorporate married names into the names index and reporting. This automatically adds an entry for all married females and reduces the need to create AKA’s. In addition, searching is now more powerful with the ability to search for individuals with missing data such as incomplete names, or missing births, deaths or sources. You can now also attach any kind of document including PDF’s, Word documents etc. The addition of Legacy Charting makes Legacy a more complete package than before and I really struggle to think of any feature that other packages have that Legacy doesn’t. Millennia continue to impress me with their innovation with features such as the new integrated mapping. With such a rich feature set this software represents outstanding value at just $29.95.